The storage of liquids and semi solids as finished products together with the the packaging materials requires increasingly larger storage capacities. Lichtenheldt is well prepared: In total, up to 8,000 pallet spaces are available in over 5,000 m² of storage space. This includes separate storage facilities for toxic materials as well as flammable liquids. A temperature-monitoring supervises the compliance with the requested product-specific storage conditions. Additionally 300 pallets spaces with explosion protection are available. 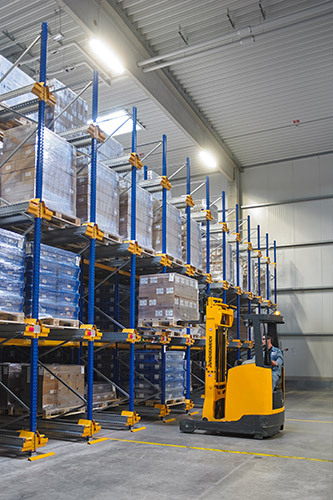 A professional warehouse organization is supported by a modern ERP system, whereby each movement of goods is clearly identified and recorded using a barcode-based system. The internal transport and the loading of the trucks are carried out with environmentally friendly electric transport vehicles. Logistics are perfectly adjusted to the requirements of the flow of goods for both incoming goods and the dispatch of finished products. Thus, it also allows for short-term response times in case of exceptional demands of our customers. A close cooperation with certified (including AEO) transport companies or external carriers offers the possibility to optimise the dispatch or to coordinate special terms of transport in Germany and abroad.